This year, the football team is going through a rebuilding phase so that they can change game and create a better football team in the future. I was given the chance to discuss with seniors and captains, Christopher Bender and Sebastian Valdes, and Head Coach Wayne Racine about the up and coming football team. 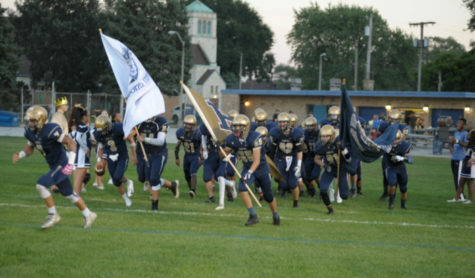 “All we can hope to achieve is to win as many games as possible and leave the student body, fans, alumni, and everyone else with a positive image of what Bishop Noll football is really about,” said senior captain Chris Bender, running back..
Senior Sebastian Valdes explains that the underclassmen are the solid foundation of the team since they are the ones who will be left with working on the team. Valdes also says that he cannot wait to return as an alum of Bishop Noll, coming to the homecoming games and seeing the progress Racine and the players have done. Coach Racine is not the only one out there with the players: behind him he has a great staff helping the team become better than they were. “Our assistant coaches this year are Coach Miller, defensive line, Coah Laird, offensive coordinator, Coach Dave Padilla, our CB(?) Coach, and Coach Mullaney, the offensive line coach.” said Valdes, senior. According to Valdes, the team this year has about 20 players. Valdes also says that the transfer students they have have really done a great job contributing to the team. Shebish transferred last year from De La Salle in Chicago, while Rebeles transferred from Mount Carmel. In addition to these two, sophomore St. Francis de Sales transfer Amaurii Fallen, running back, rounds out the team as a lead scorer. The biggest growth in improvement comes from the large amount of freshmen entering the program. This year, the team has ______freshmen playing junior varsity. But despite a successful JV season, the team still has to be able to increase numbers before they return to a full-fledged varsity team in the fall of 2020. Bendersays that the plan is simple: if they win enough games this year, and get a positive status and reputation, the numbers will take care of themselves. Prospective players will be drawn to a team with a winning record and good attitudes. As these two senior finish up their last season here a Bishop Noll, they both want to leave the team in hands that will revive a lost Bishop Noll culture, look back at these JV years and watch how much they have grown, and next time around, go out with guns blazing.